On my Dad’s side of the family, I have 3 male cousins, and 13 female ones. And then there’s my sister and me. I have fond memories of the birthday parties we used to have when we were kids. I’m not sure how many of these we actually had, but I remember the games we used to play at these parties and even going in costume for at least one of them! As we grew up, we saw less of one another. Some of us were overseas, and some of us were always busy with work, boyfriends, or other commitments. It was only over Chinese New Year, on our Mama‘s birthday or occasionally over Sunday lunch at our Mama‘s home, that we met. And even then, there was seldom much time to chat, nor much to chat about anyway. After the passing of our Mama, I realised with sadness that we’d probably have even fewer opportunities to meet. But things seem to have come full circle. Most of us now have our own kids, and in the last couple of years, we’ve been gathering at birthday parties once again, and over Christmas and Chinese New Year. Because of the resounding success of the “Two Is Enough” campaign of the seventies, most of us have only one, or at most, two siblings. This means our kids don’t have as many first cousins as we do. So it’s really good that all our kids get to play together. A bit of a riot maybe. But in a good way. Today my female cousins and their families came over for lunch. On the menu were Nonya Laksa and Chicken Rice. Save for the garlic chilli which I made to go with it, I left the Chicken Rice entirely to W, who does it better than I do anyway. Besides, I already had quite a lot on my plate preparing the laksa. 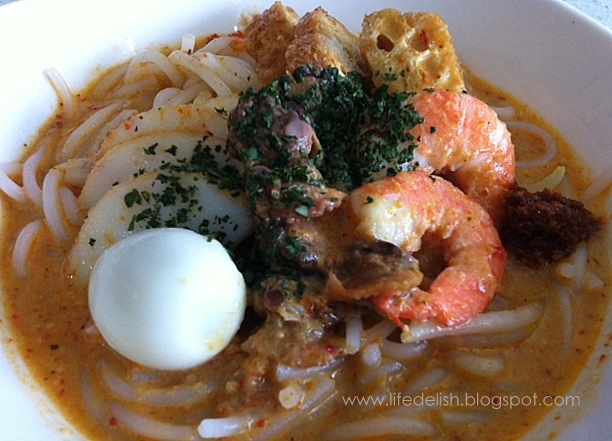 Nonya Laksa is essentially a rich coconut-based soup with noodles. It is extremely tasty – spicy, sweet, salty, very aromatic, and so addictive that it’s hard to keep from wanting to slurp more of the gravy. I tend to think of the soup more as a gravy because of how complex it is. However, cooking it involves many ingredients and steps, which makes it rather time-consuming. So I reckon it only makes sense to cook this when you are going to be feeding a whole lot of people, in order to make it worth your time and effort. Since we were expecting 20 adults and many kids (you’d think it was 20 of them from the noise level), I decided this was a good time to make this dish again. This was my second go at it, so I already had the chance to re-think the recipe and work on it. Three days ago, I’d started by making the sambal with heibee (dried shrimp), belacan, shallots, galangal, lemongrass and red chillis. Yesterday afternoon, I worked on the rempah (the paste for the laksa gravy). This involved peeling, chopping and pounding heibee, shallots, garlic, galangal, lemongrass, dried chilli, candlenut, some chopped laksa leaves, and a little turmeric, then grinding it all up into a paste before frying it in oil over a wok for some time (in two batches because of the quantity). This morning, 1.5kg of prawns were cooked, and their heads and shells (together with more heads and shells we’d stored in the freezer earlier this week) were used to make prawn stock. For the two hours during which the stock was simmering, preparation of all the other ingredients began – prawns, eggs, beansprouts, tau kwa, fish cake, and cockles. I used fresh blood cockles this time, rinsed them something like 100 times till they were clean, blanched them in boiling water, refreshed them with cool water, then allowed them to cool, before removing the flesh. Once the stock was ready, it was strained, the rempah was added to it, left to simmer for some time, before the coconut milk was also added to it. Then I chopped more laksa leaves for sprinkling over the individual portions. I have observed that the aroma of laksa leaves is strongest when it is uncooked, just as with coriander. Therefore, although many laksa recipes seem to call for laksa leaves to be simmered in the stock, I actually think what is more important is to have chopped fresh laksa leaves sprinkled over the dish before serving, as this is what gives the dish most of its characteristic aroma, without which it would be just a bowl of spicy prawn and coconut soup. While all this may sound like hard work, I really enjoyed every minute of cooking this. Like the H once said, even when I start out feeling tired, the high I get from cooking gives me a second wind which will keep me going quite happily. Besides, the result made it all worthwhile, and many of us went back for seconds, myself included! It was a good lunch which we all enjoyed. W’s Chicken Rice was also quite a hit, as was the Devil Curry cooked by my cousin’s husband, C. And it was so pleasant to just relax and hang out together, playing with the babies, chatting and watching the older kids play together, as we sampled more Chinese New Year goodies as well as an assortment of Sri Lankan Tea which C had brought. And of course the kids had a ball as usual! It warms my heart that the bond among us cousins seems to have grown stronger than it has ever been, and often I imagine how pleased Mamawould be. (Note: In case you’re wondering, I’ll be posting the recipe after I’ve worked on reducing the proportions for the ingredients).